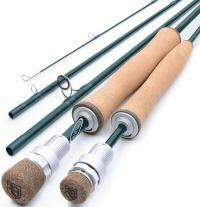 There can be considerable cross over between rods for small, streams brooks and rivers, so there are no specific rules. For example rods for fishing a small stream or brook with little bankside vegetation can be similar to those for fishing a river. However, tight casting on brooks for small trout and can require much smaller and lighter rods. Longer rods are useful on wider rivers to facilitate mending the line to avoid drag as well as for longer casts and playing potentially heavier fish. Also, many UK Chalk streams do not permit wading and a longer rod will help operating over the bankside reeds and instream weed banks. Faster action rods will normally provide more accurate casting and quicker hook setting They tend to be less forgiving of poor timing and may require more expertise. A slower, softer action can be better for playing fish and for the inexperienced angler they can present the fly more delicately. The lighter line weight the more delicate the presentation, but also the smaller the fly which can be used. 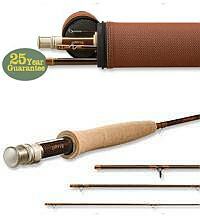 So the choice of fly rod for trout and grayling will depend upon the style of fishing and the immediate environment. Factors to take into account before choosing are the size of water, the vegetation, the size of fish and fishing methods, wet, dry or nymph. The lighter line weight, the more delicate the presentation, but also the smaller the fly which can be used. The STIFU is the fastest rod in Vision's freshwater fleet. The blank is light, responsive and sensitive when short delicate presentation counts. 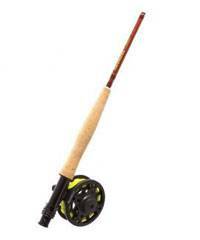 Flexing the rod deeper with good technique and increased line speed will make easy work of long distances or casting into headwinds. Its the perfect range of rods for all your trout fishing needs. Glass Trout is pure fibre! It has a deep bend whilst offering plenty of power for longer casts. This is not a traditional glass fibre noodle type rod, it performs well with a whole manor of different types of fly line. The GLASS TROUT is best in smaller to medium size rivers with short to medium fly line head lengths, especially our short Vibe 65. With that line itll turn over big, hairy dries or heavy nymphs with ease. When playing a fish they feel like rubber shock absorbers keeping the fish hooked until its release.  7ft 6in, 6wt, 2 piece.  Chrome plated stainless steel snake guides and stripping guide. The amazing Spectre® Fly Rod range, launched in 2017, has been upgraded for 2019! Incorporating the very latest American Tackle Microwave Stripper Guides for the ultimate line control performance. Snowbee were the first UK company to incorporate American Tackles Microwave guide system into a range of spinning rods back in 2014. The resulting line control was nothing short of spectacular... and got us thinking whether the same technology could be applied to fly rods. Having worked closely with American Tackle since those early days, the new Microwave Fly Rod guides were finally launched in mid-2018. Once again, Snowbee were the first company to embrace this new technology and the sensational new Spectre® RMX fly rod prototypes were shown at EFTTEX in Amsterdam and ICAST in Orlando in 2018. 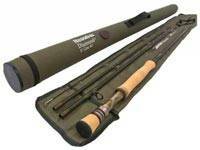 Presented in pearlised grey, these Medium Fast rods are designed for freshwater fishing and finished using the highest AAA grade cork, Loops unique triangular reel seat, hard chrome snake guides and ultra performance carbon fibre. 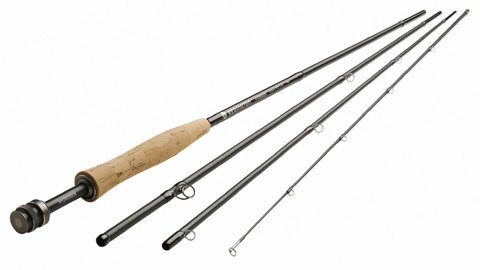 The CAST Medium Fast rods allow you to fish all day with maximum performance and minimum fatigue. The Loop Xact Rod series has a smooth, deep, medium-fast action that is both forgiving and precise. This is no entry-level stick, and represents a lot of rod for the money. All the technology, style and feeling at a realistic price. Triangular reel seat and cork mix handle. Vipu means lever in English and is a great name for this new rod series - when you are casting with these rods, your fly is disappearing to the horizon with rather respectable speed. 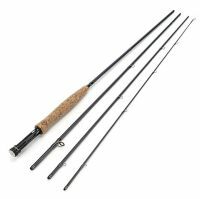 These 4 piece dark brown Vision trout rods have clearly medium fast action, which will make them good all-rounders for almost every imaginable situation. One can easily claim that, in the Vipu series, a classical outlook and a very easy casting functionality have been successfully wrapped in a same neat package. It is a package which on top of everything else is almost ridiculously cheap. 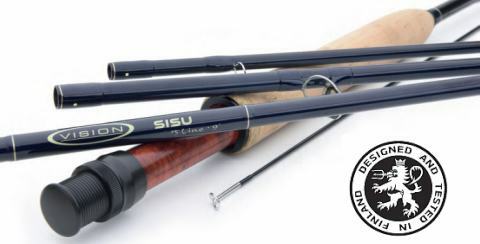 EKA (First)are incredibly versatile rods in their price range. The blanks are made from 24ton low resin graphite making these rods very light in weight and well balanced in the hand. Thanks to their 4 piece construction and narrow, light plastic tube these are easy to pack for your travels. The matt finished graphite colour blank suits a stealthy approach favoured by so many modern day anglers. Narrow cork handles are sensitive and finished with an anodised reel seat to hold your reel firm. The Recon 3-weight is a strong choice for anglers who love to chase native fish on small streams, but like a rod that will give them the "oomph" they need when the fish range out of fingerling size. The 8'4" length allows precise placement in close quarters but is capable of sending a cast over bigger water with ease. An excellent choice for the dry fly angler. 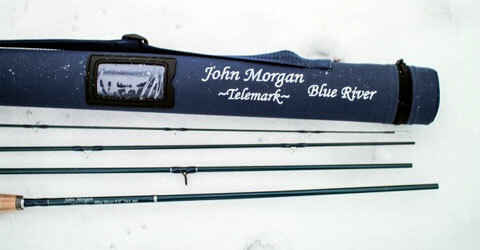 One of the most classic rod length/weight combinations available, the 864-4 rod saw many an angler to their first fish. Reborn once more with the shadow green blank and sleek design of the Recon, it is ready for a new generation of exploration. Seen by many as the best all-around rod size on the market, the eight-foot six-inch five-weight is the ideal rod for the one-rig angler with a preference for smaller water. For years, this weight was the best-selling fly rod model in the Orvis line, and Recon carries on that tradition with aplomb. The slightly shorter length allows for small stream versatility, but high modulus graphite ensures this rod came to play when faced with larger water. Present small dries with finesse and larger flies with accuracy, while maintaining the lightweight sensitivity of a five-weight. The 9-foot 4-weight is beloved by anglers for many reasons. 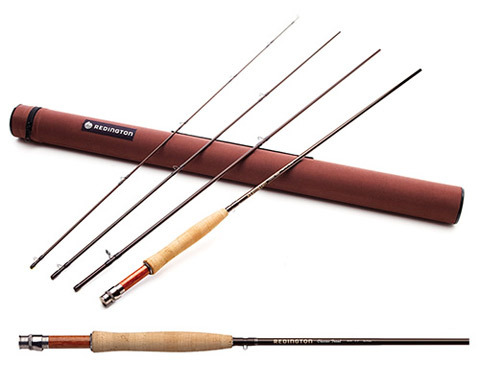 Versatile across all manner of water, it will be the small stream rod you reach for on a blustery fall day and the dry fly rod in hand during a calm summer morning's PMD hatch. The Recon 904-4 offers the delicacy of the four-weight line with the backbone to reach out over larger water. 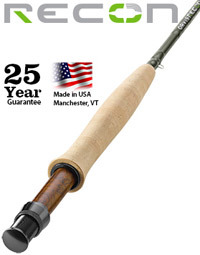 a Classic and one of our biggest selling fly rods! 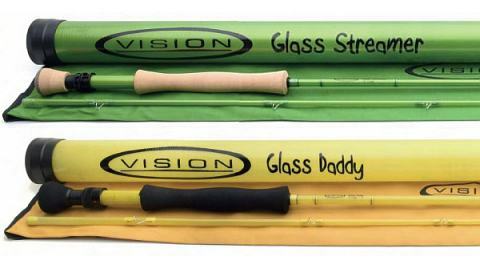 Designed initially with juniors in mind, it has been universally adopted by small stream anglers. Its short length and higher line rating, has been designed for faster loading in small hands and it has proved ideal for brook fishing, particularly in windy conditions. Look out Dad - this isnt another toy - Junior might just be out casting you, with a bit of practice!